I am going to share something very personal with you. I have big hands. I wear size 9 gloves. Since women's gloves are only available in, (at most,) a size 8 and a half, for years I was relegated to buying men's gloves. Men's gloves are clunky, boring and only come in black, brown and tan. I was unhappy. Sometimes I forget that the Internet exists. And then I remember, "Wait a minute, I can do a search to find a company that makes bespoke leather gloves for women." They make custom gloves in my size, in any color combination I can dream up. Winter gloves, driving gloves, walking-the-dog gloves. For under $200. And if I am not delighted with the fit or the color - I just send them back - until they get it right. The customer service is top-notch. The Internet is an empire of bespoke opportunities at every price point, and in every retail category. 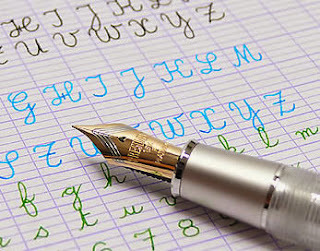 Case in point: I am a huge pen nerd - I went to a French Lycée where I learned how to write with a fountain pen on Séyès ruled notebooks. I couldn't find them in the U.S., so that was that. Decades went by. Until a few months ago when I entered "seyes ruled notebook" in a Google search window and BAM! up came the Goulet Pen Company, a Mom and Pop online shop headquartered in a small town in Virginia. They pretty much sell only three things: notebooks, fountain pens, and inks. And the Clairefontaine Séyès notebooks of my childhood! In addition, for years, I had been looking for that elusive animal, an inexpensive pen that writes like a $300 Pelikan with a 14k gold nib. The Goulet folks sell the Jinhao x750, a Chinese fountain pen that has the heft of a serious writing instrument and costs under $10! They make their own steel nibs in a variety of types and sizes for $15 each. At my request, they installed one of their custom nibs on a Jinhao body and voila! my dream pen - it writes smooth as silk. This little company pays supreme attention to detail. Even an $8.00 notebook is carefully wrapped so that it arrives in pristine condition. Every package includes a note, a book mark and a Tootsie Pop Miniature. Everytime they send me something, it's Christmas in July!